Maple Grove Cemetery began operation in 1983 and has eight developed gardens with over 4000 spaces available for burial. Maple Grove is a perpetual care cemetery offering gardens with upright monuments, as well as bronze gardens with memorials placed flush with the lawn. We have the most beautiful community mausoleum in the area, with several sights available for private mausoleum entombment. A columbarium for placing cremains is available in one of our gardens as well. 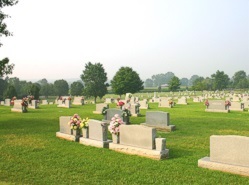 There is a fulltime maintenance person that provides excellent care to this beautiful, country cemetery.